My neice Urszula, or Ula as she is always called at home, is the youngest of my cousin Adam’s three children. From the shy early teen she was in 2007, when first we met, Ula has blossomed into a beautiful and stylish young woman. Today is her 20th birthday and I’d like to take this opportunity to wish her ‘Happy Birthday’. Wszystkiego najlepszego na urodziny! 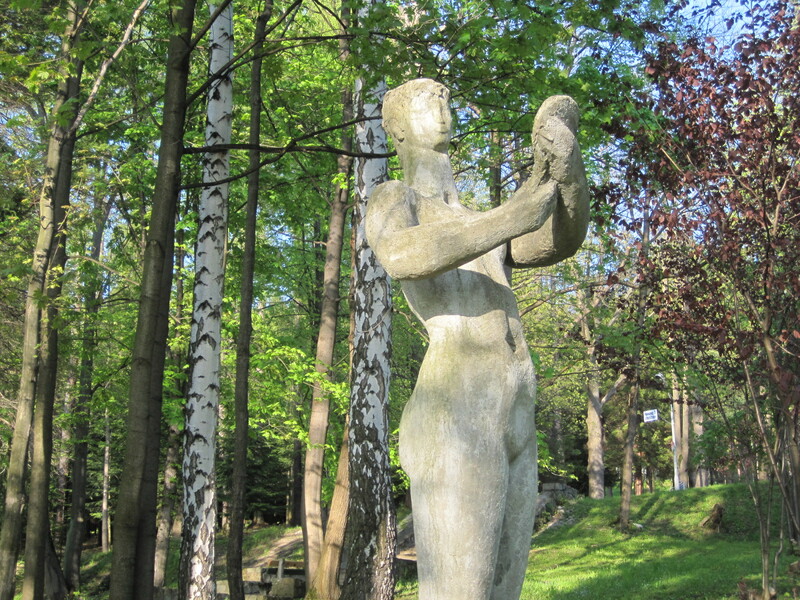 My Personal A-Z of Poland has taken me down many routes and shared many stories. Dad, along with millions of others, paid the price of a war torn Europe. His family was scattered far and wide, but for Dad there has been a belated happy ending. I’d like to share with you today a video that had tears streaming down my face, but which also ends joyfully. Ann, or Gallivanta is a warm-hearted lady who is proud of her country, New Zealand. This week I received from her a link for my Jo’s Monday walk. It’s not strictly a walk but it is a very moving journey and I thought that it deserved a place here, alongside Dad’s story. I know that it’s the kind of story that Frizz will find empathy with, and won’t mind me sharing it on his Tagged- U. I’d like to thank so many people for the love that is shared in our blogging world. 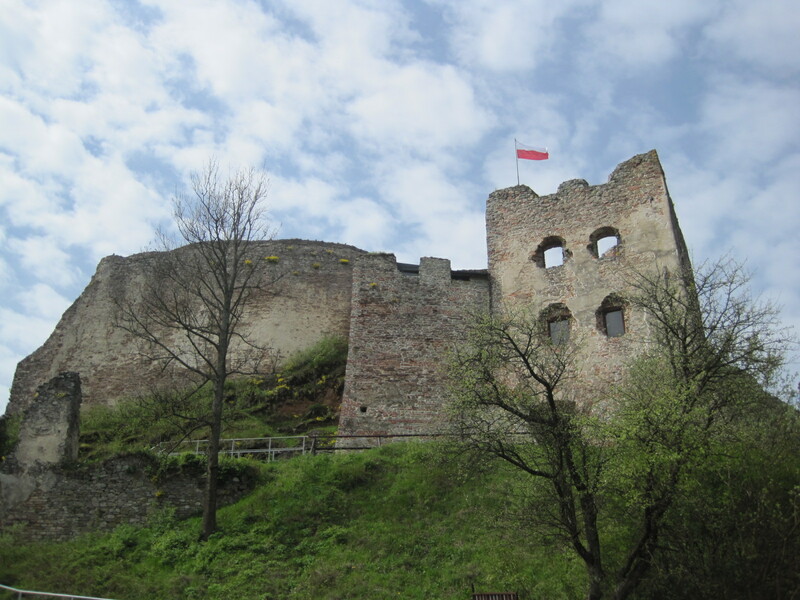 I’m feeling quite emotional this morning and I think it’s time to go back to playing with Polish castles. Thanks also to Julie Dawn Fox for the personal A-Z challenge. Mountains and water are, for me, a pretty irresistible combination. 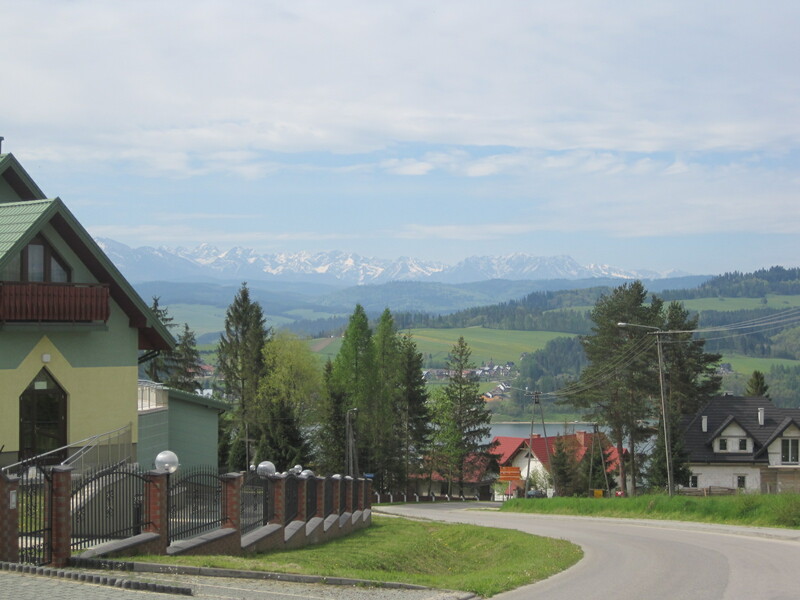 On my recent visit to Poland, this is as near as I got to the Tatry Mountain range, but what a magnificent backdrop they make! 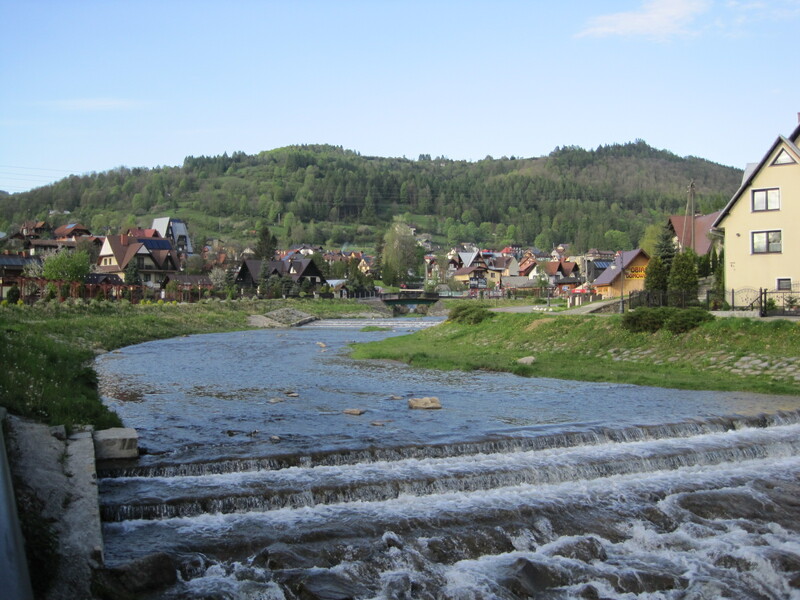 Situated to the south of Kraków, they form a natural border with Slovakia, and are the highest mountain range in the Carpathians. 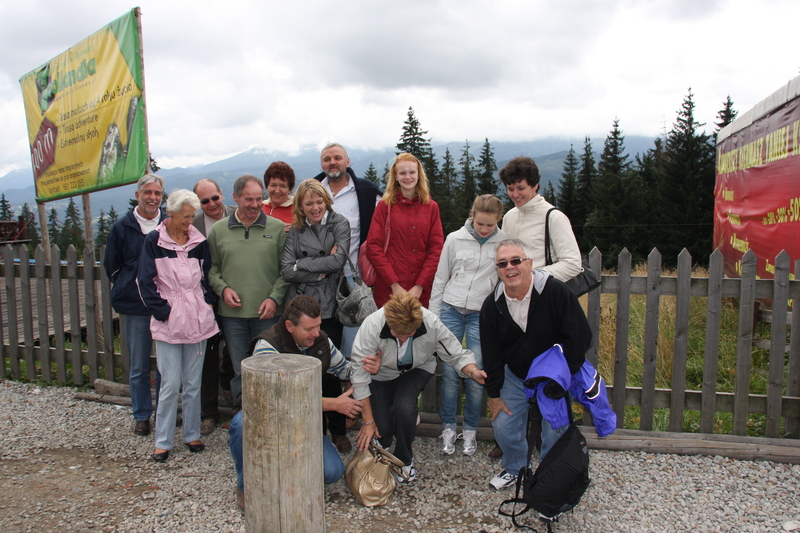 At 2499 metres Rysy is the highest peak on the Polish side of the range. 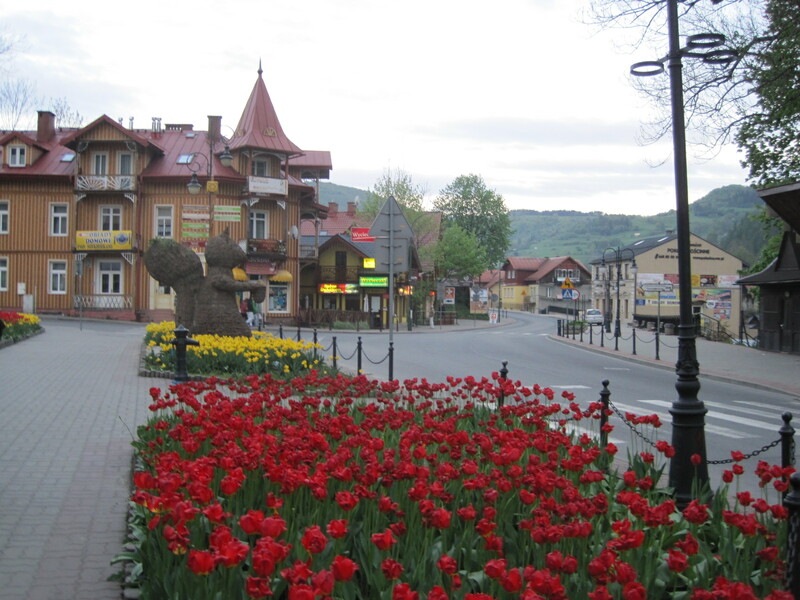 Zakopane is regarded as the ‘winter capital of Poland’ but is a highly popular destination for hiking in summertime too. 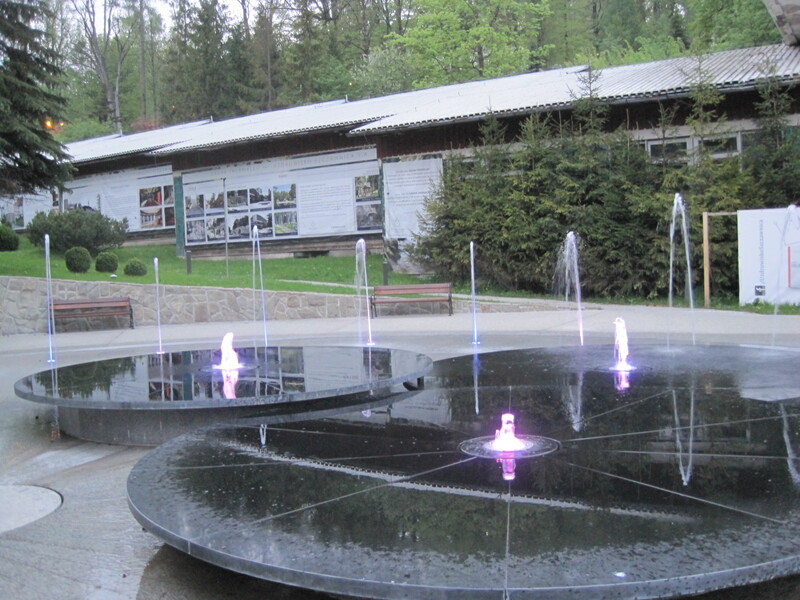 I was lucky enough to be there for Silver Wedding celebrations in 2009 and Z is for Zgorzelec and Zakopane tells that story. 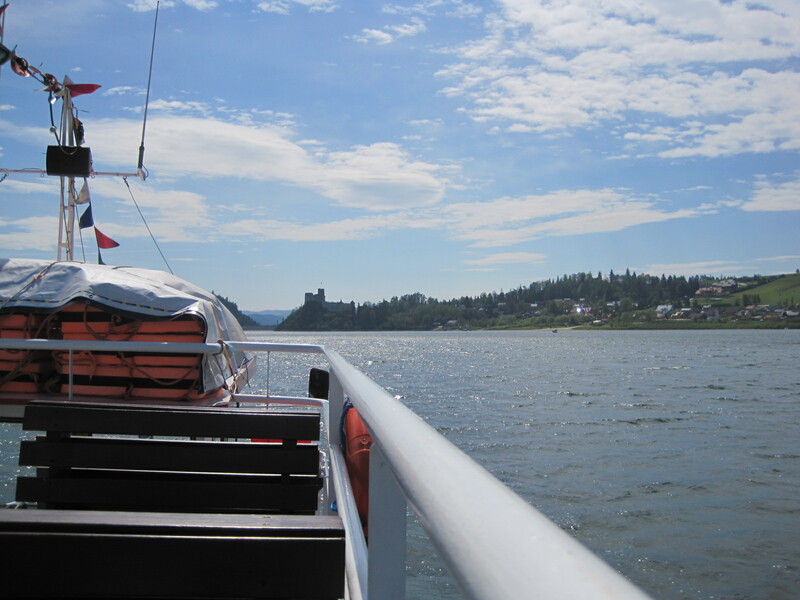 This post will take a very different path, and includes a ferry crossing on Lake Czorsztyn. Imagine this view from your garden! 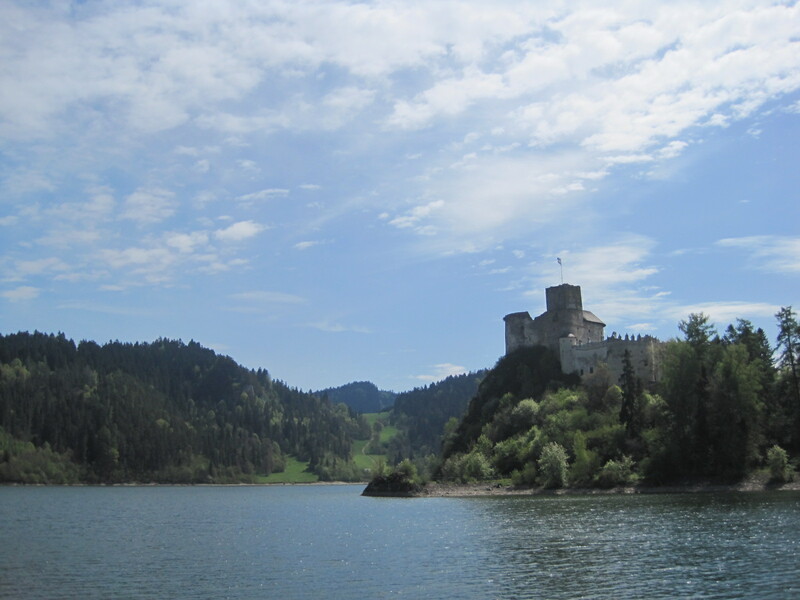 On our trip to the Pieniny Mountain range, much lower than the Tatrys, we passed alongside of the lake and I gazed in awe at the spectacle beyond. I knew that if it were at all possible I would be back for a closer look. And so my return to Kraków was by a very roundabout route. To the gondolas? Or the castle? 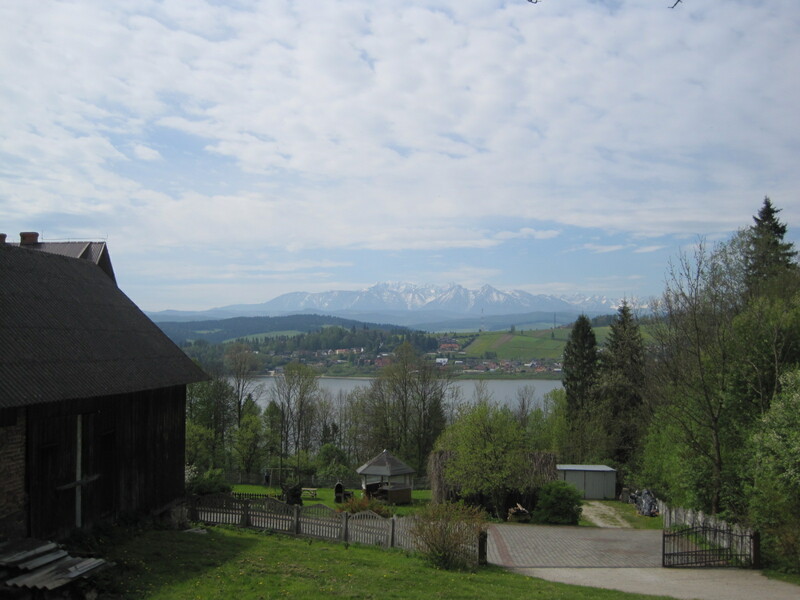 The Tatras, as they are known in English (Tatry is the Polish plural) sit tantalisingly out of reach but ever present on the horizon. Looking out across the lake, I can just see the tips! And then we’re off, in search of another castle! I won’t attempt to show you around the castle, because I think it deserves a post of its own. 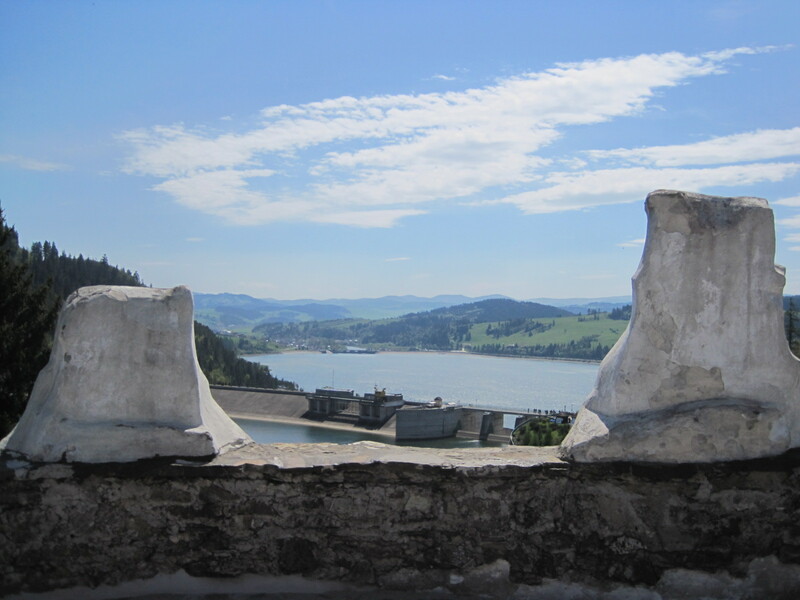 But I will give you a couple of views from the battlements, to tempt you back. 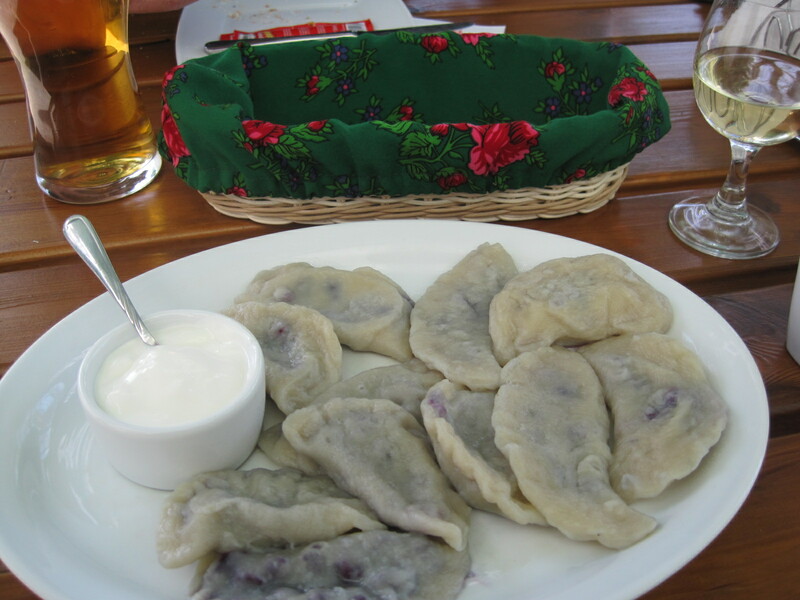 I had Pierogi z jagodami and delicious it was! We were assisted in our enterprise by a very charming couple from Warsaw, who observed me struggling with the language and the bus timetables. 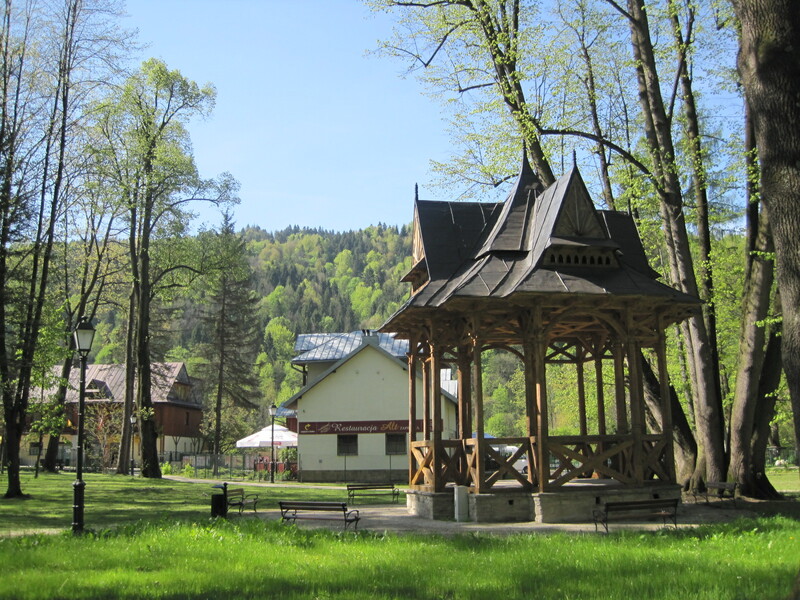 They had been to the area a number of times and were off on a hiking expedition to Trzy Korony (Three Crowns). It would have been very tempting to join them, but instead they ensured that we were dropped at the right spot and pointed in the direction of the lake. 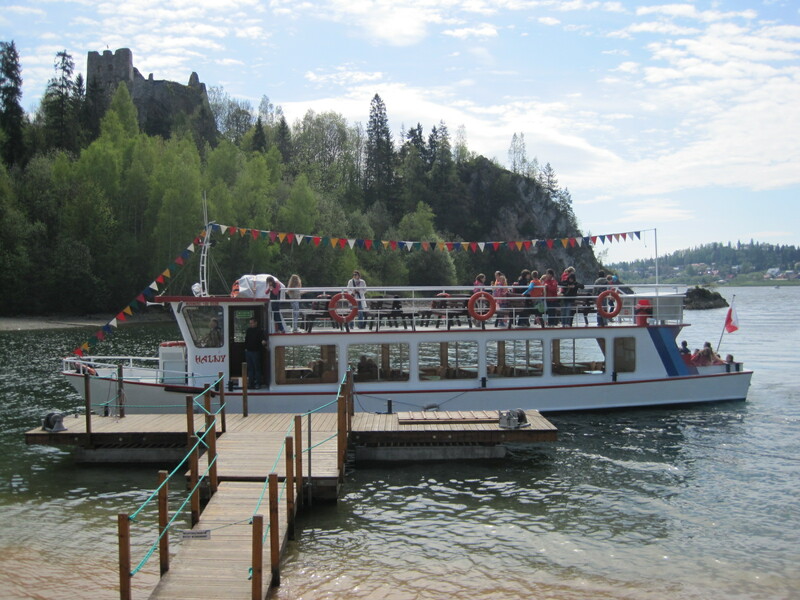 They also suggested that we might find a bus connection from Niedzica directly back to Kraków, which we did, instead of returning across the lake. 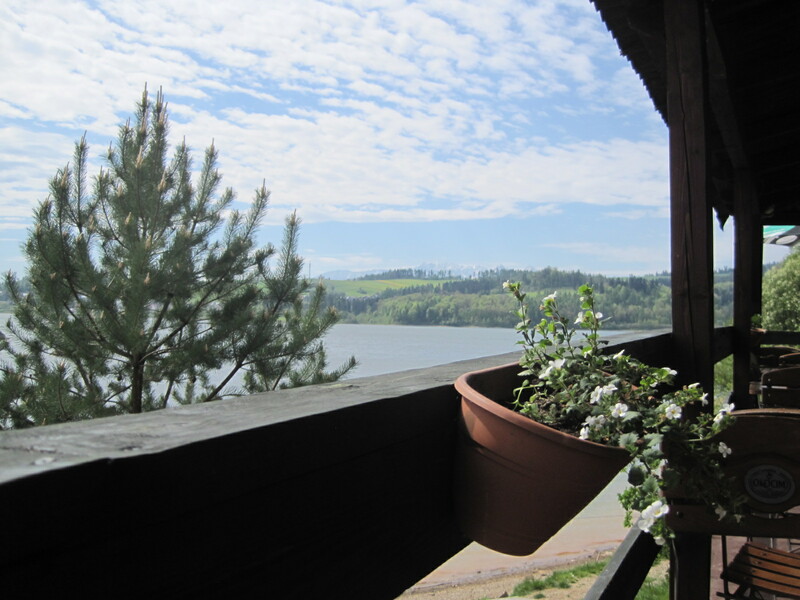 But not before sampling some typical mountain food- filling but delicious pierogi or dumplings, at “Karczma Hajdur” restaurant, by the lake. I can highly recommend it! 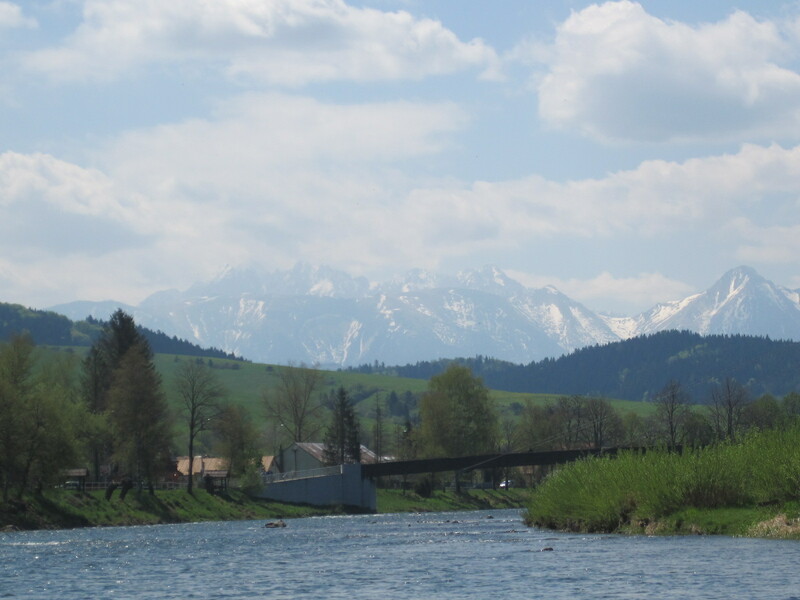 Just one last shot of the Tatry Mountains, taken on another expedition, on the River Dunajec. I’m going to be a little ambitious and link this to three different challenges. For some time I’ve been trying to complete my Personal A-Z of Poland and this is yet another step in that direction. Many thanks to Julie Dawn Fox for setting me on the path. I’ve also been joining Frizz whenever I can. This week he’s Tagged T, which just happens to be a perfect fit. He’s another very kind host, so do visit and take a look around. I’m sure most of you know Cee. She’s a legend in the world of photo challenges. I have joined in on her Which Way challenge in the past but have struggled to find the time lately, so I’m hoping she won’t mind “sharing me”. Cee loves directions and signposts in her challenge, and wherever I go now, I find myself snapping away every time I see a sign. It’s addictive! So there you are! I hope you’ll find the time to join in on one of them, while I think about where you might like to go next. Well, where else should it be? If you saw my Monday walk this week, you’ll know that I have a new Polish love in my life. 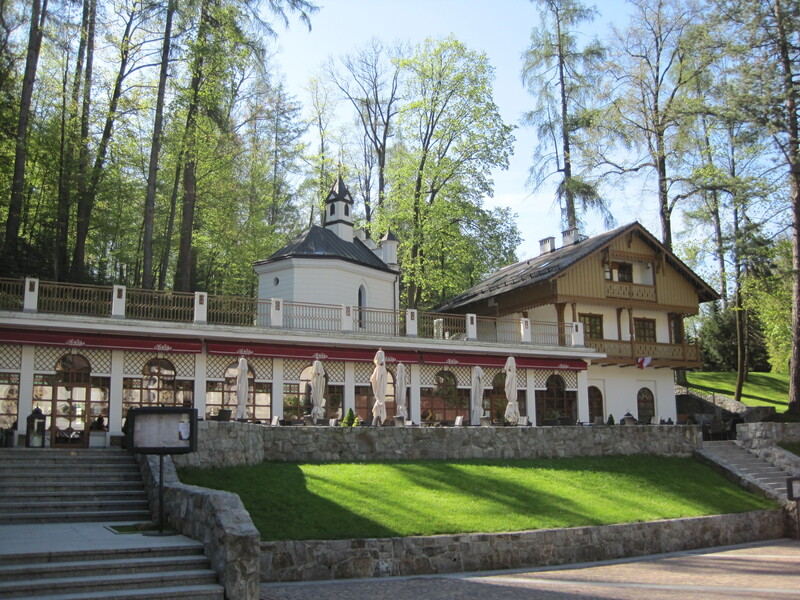 The thermal spa town Szczawnica in the very south of Poland, where it meets Slovakia, was a rich discovery for me. Alkali sorrel springs and a temperate climate make this an ideal base for the treatment of respiratory and digestive ailments. 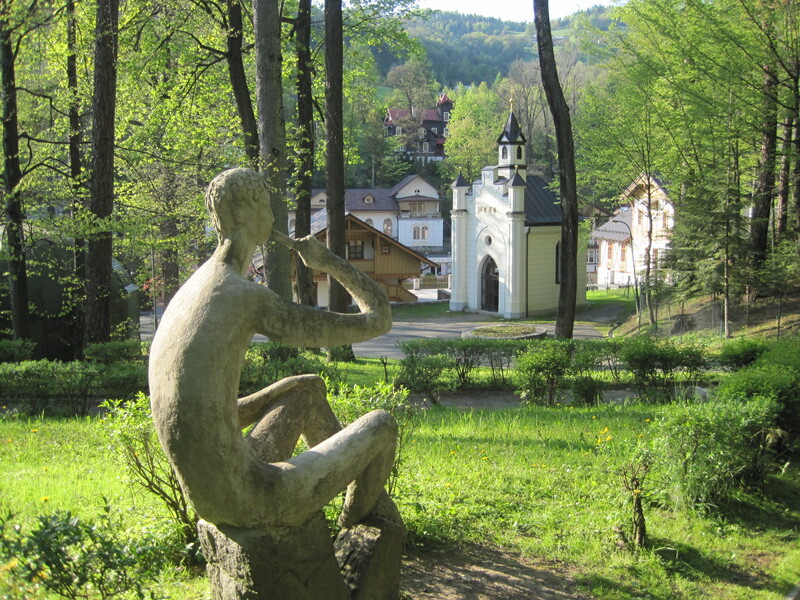 In the mid 19th century a doctor, Jozef Dietl, saw the potential and began the development of hydrotherapy treatments unique to Poland at the time, turning Szczawnica into a spa town. 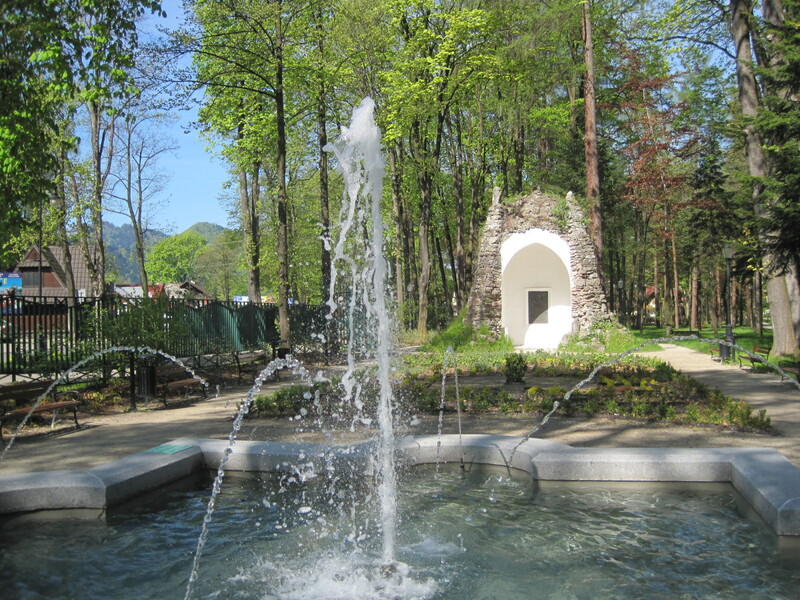 An Inhalatorium equipped with pressurised rooms was built, and in the woods, Willa pod Modrzewiami (villa under the larches). 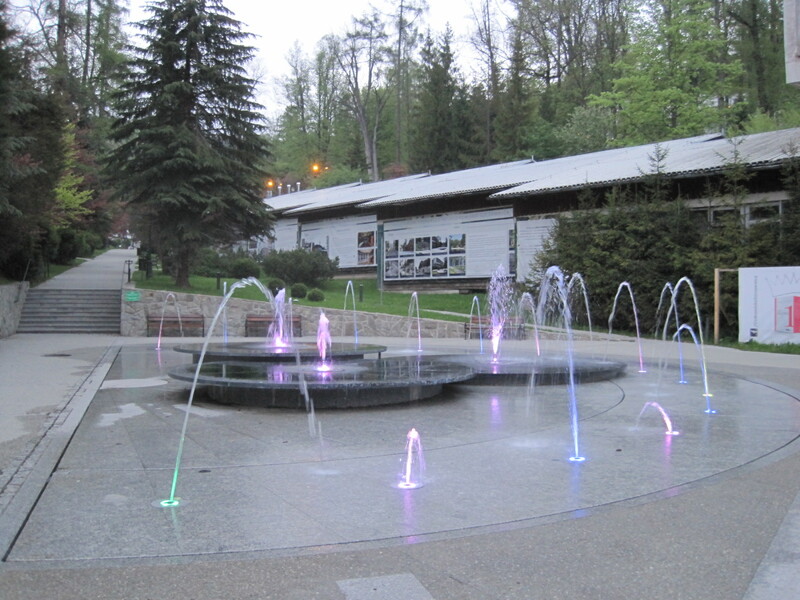 The start of World War II halted developments and in 1948 the spa was nationalised by the government and used for the treatment of miners and metalworkers. 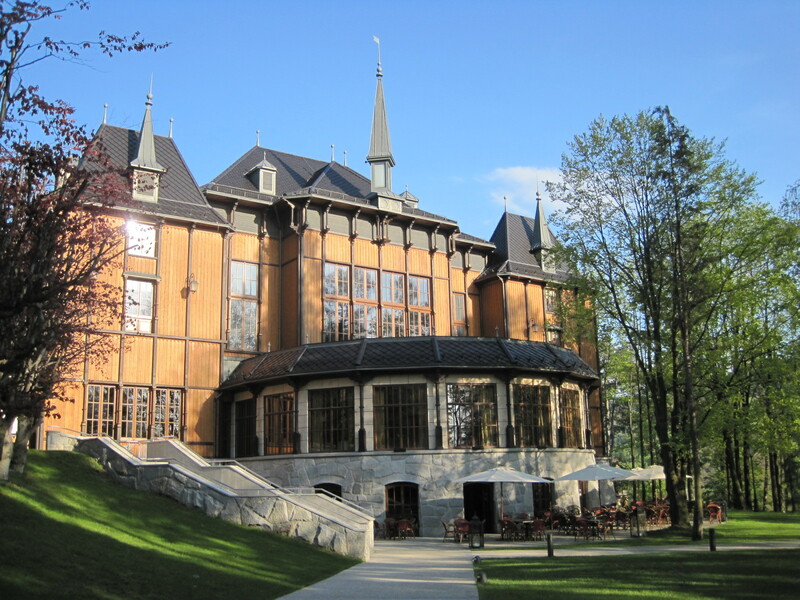 It was not until 2005 that the ownership of the resort was returned to descendants of the Stadnicki family, the pre-war owners of the estate. 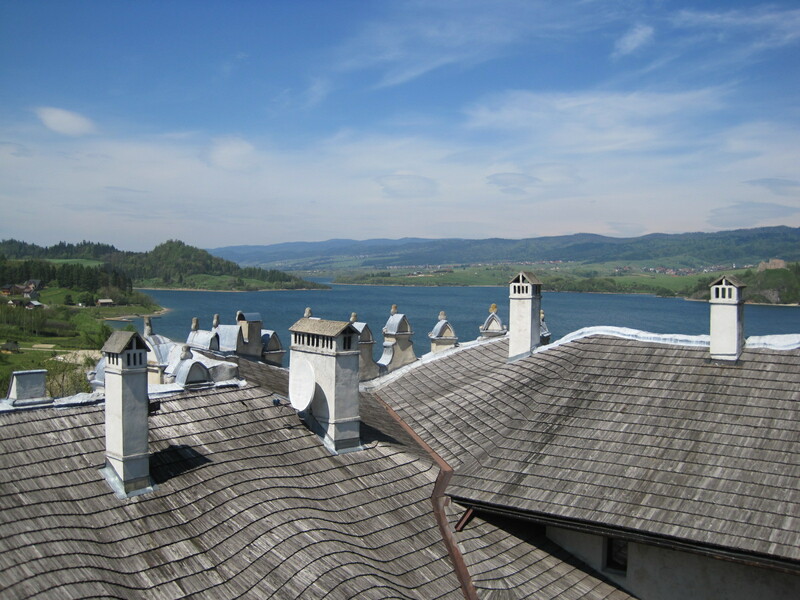 They invested hugely to restore the spa to its former glory. 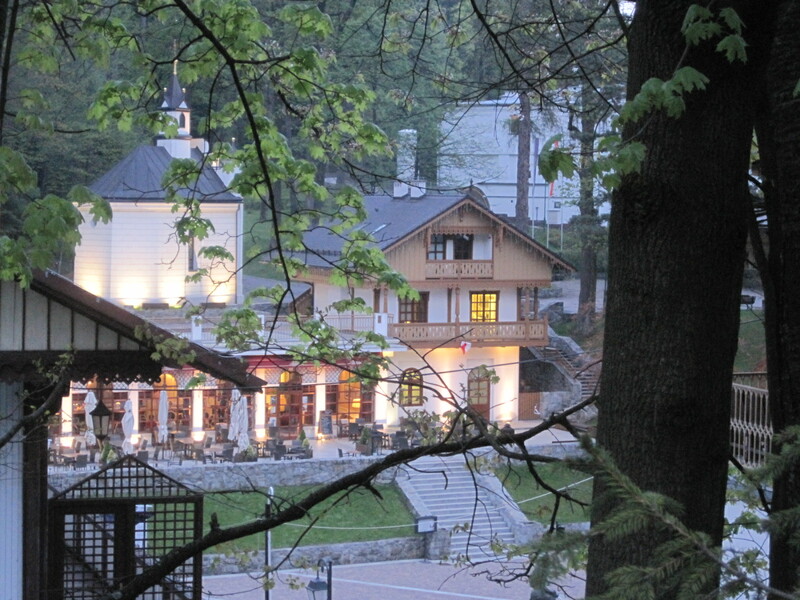 Dietl Square was rebuilt to its historical design, with Cafe Helenka at its core, and, in 2oo9, 5 star Modrzewie Park hotel replaced the villa. 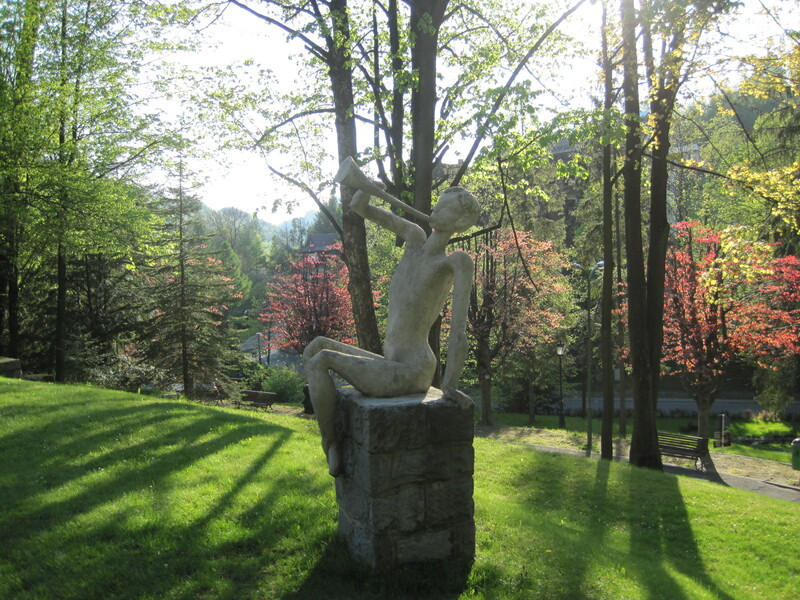 A museum dedicated to the project soon followed. Down in the lower town, a flurry of Spring flowers! And naturally, there’s no shortage of water! And bridges by the dozen! And did you ever see a quirkier souvenir kiosk? Not for us the 5 star hotel! 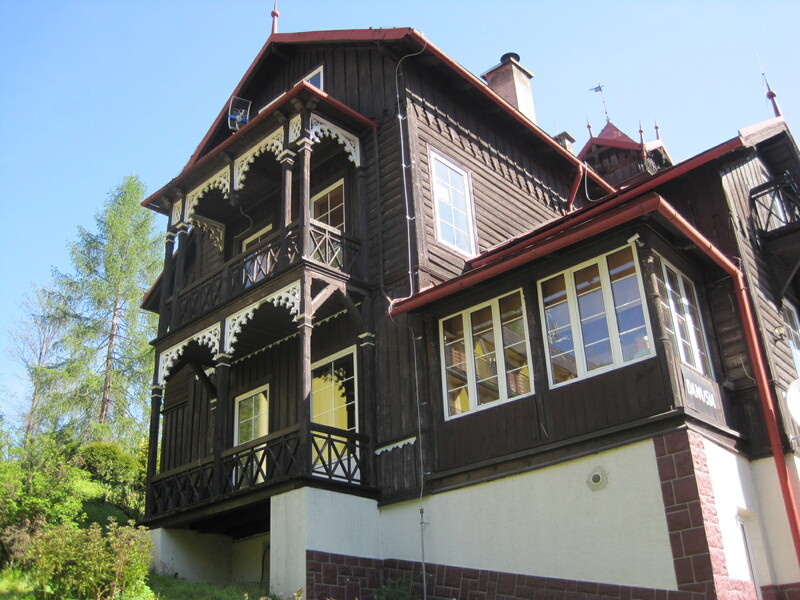 I had chosen to stay in a lovely old dark wood chalet, ‘Willa Danusia’, in the upper town overlooking Plac Dietl. Naturally that meant a steep climb home on an evening, but there’s always a price, isn’t there? 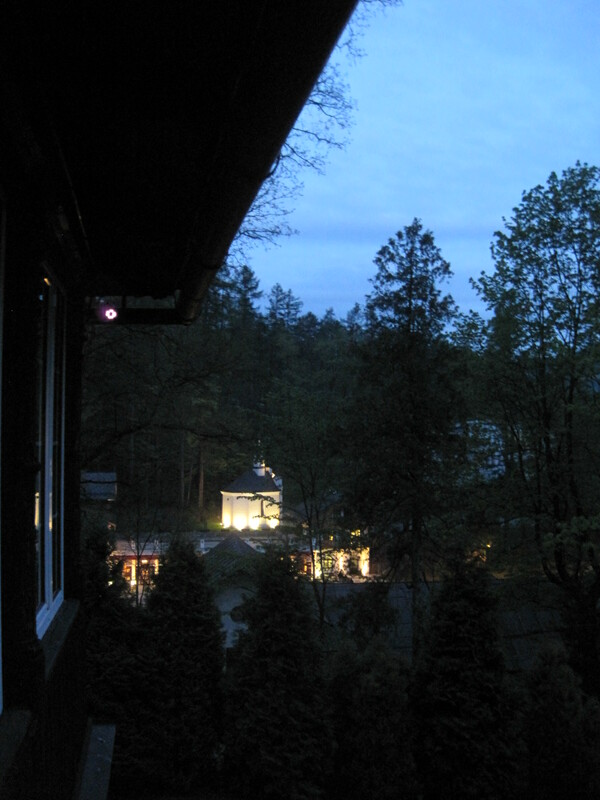 Inside the villa, the wood was pale, while the view from our lofty porch provided wonderful views. One evening we dined handsomely in the ‘Willa Marta’ in the lower town. 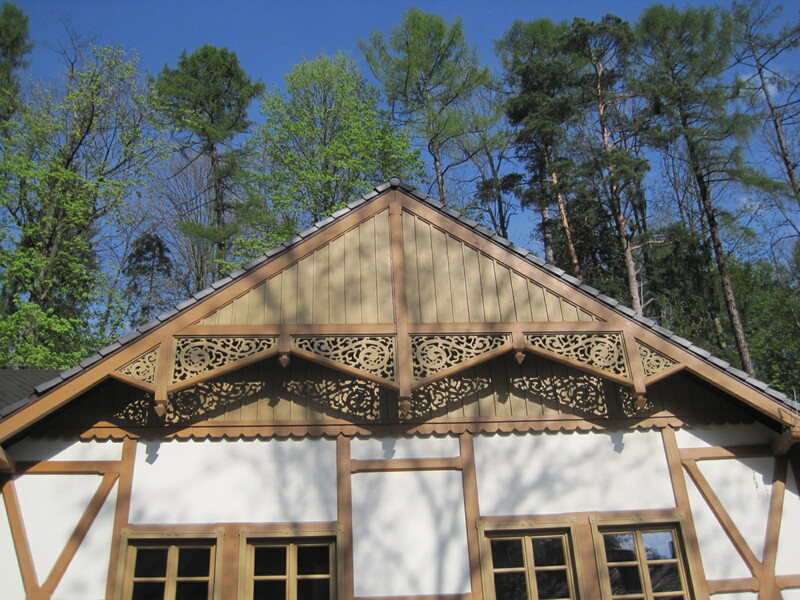 It also was constructed from dark wood, but most of the town had a more modern appearance. An evening stroll through the upper town gave me a chance to breathe deeply and make the most of the tranquil atmosphere. I know that I felt better, just for being there! 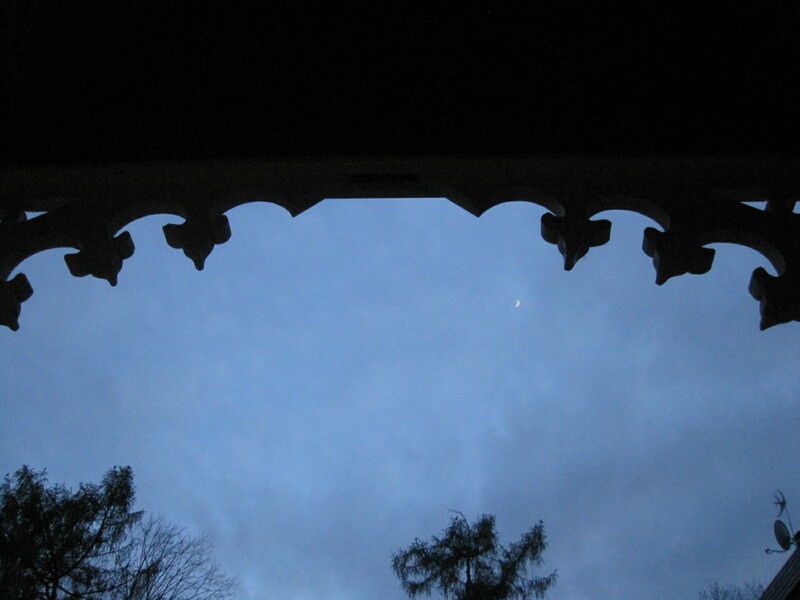 From the porch the tiniest crescent of moon is just visible- can you see it? ‘Romantykaly’, as they say in Poland. Willa Danusia cost almost nothing for a basic bedroom and a very fine breakfast. Willa Marta was perhaps a little more stylish but definitely wouldn’t break the bank. 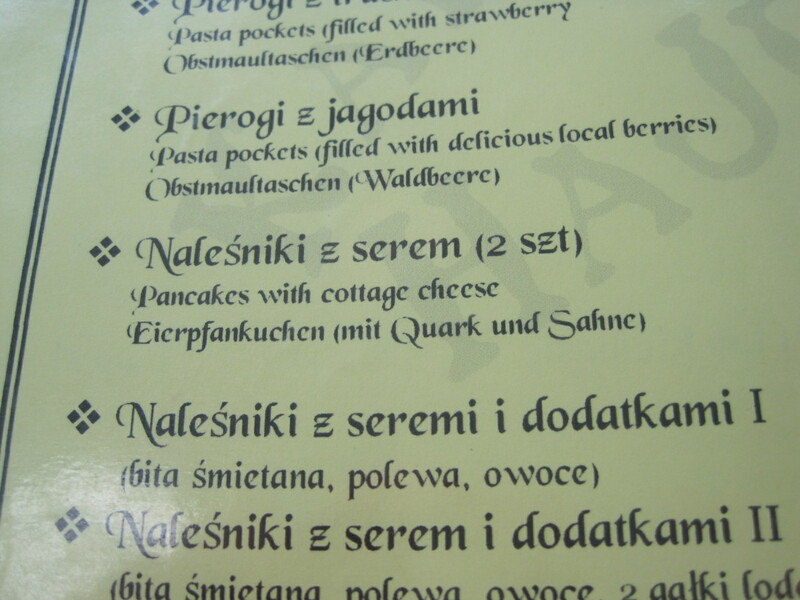 I had intended my ‘S’ post to be all about the Sukiennice in Krakow. Maybe I’ll find time to write a second. Meantime I’d like to thank Frizz for providing the incentive this week with Tagged ‘S’, and also Julie Dawn Fox for her Personal A-Z Challenge. I can promise you a wonderful read at either website, and perhaps you’d like to join in with the challenges? I’m going to struggle for photos for this post, because I visited Monsaraz on a damp, if not soaking wet, day! Seems to be a recurring theme on here lately, doesn’t it? But such was the impact it made that I loved it anyway. Some day, I hope to return and see it like this. So will you excuse me for borrowing from Wikipedia? It must have been an anniversary or a special occasion, because I was sitting at a table in “A Ver” when I first heard about Monsaraz. 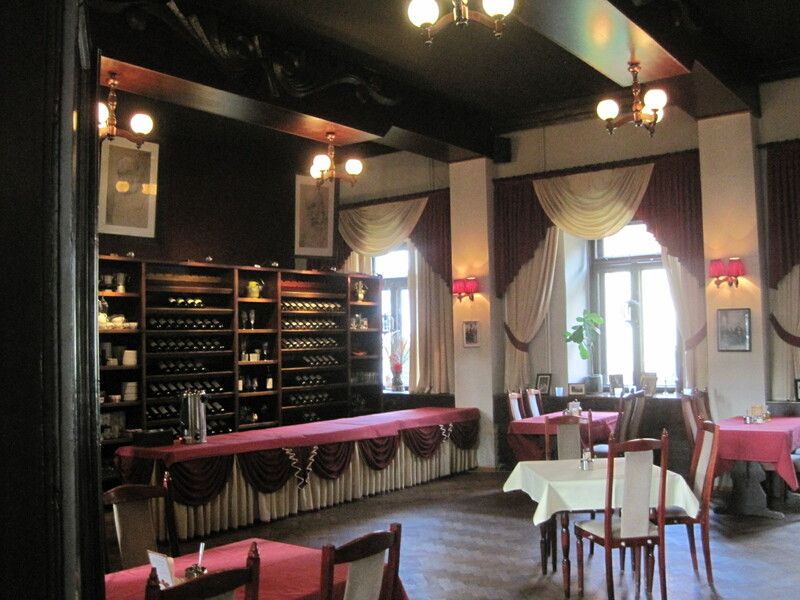 This Tavira restaurant is named for its view down over the rooftops and the prices are more than we would normally pay. But treats are treats, and so I happened to be sitting at the next table to a couple whose evening was interrupted by the wife’s mobile phone. The wife excused herself and was gone for some considerable time. I can’t remember what prompted me to start the conversation, but before too long the husband was telling me about this beautiful place that I must see for myself. The fact that it was a 4 hour drive or more seemed insignificant to him. And so Monsaraz nestled in my imagination until I could make it a reality. The “Rough Guide”, always my bible, confirmed what I wanted to hear. 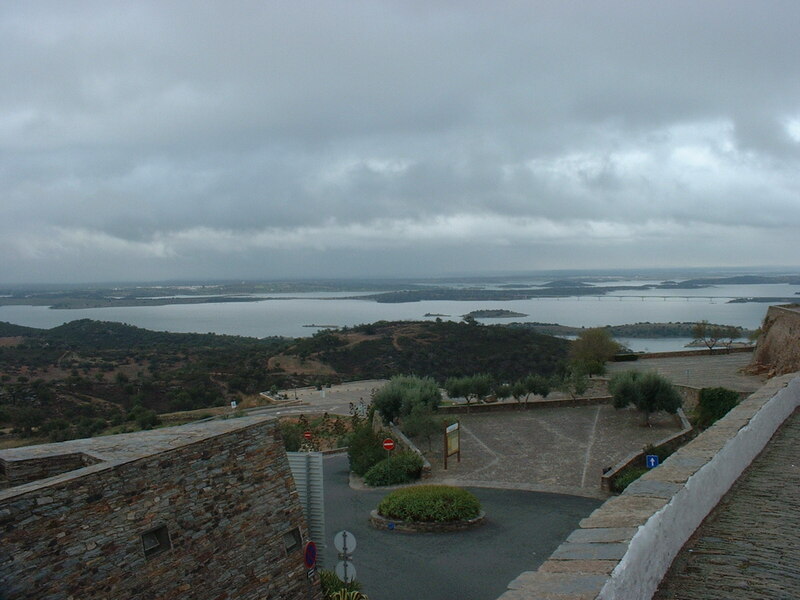 Monsaraz is a tiny, hilltop, walled village with sweeping views across the Guadiana to Spain. It’s name comes from the Iberian word for Cistus landifer, the Gum Rockrose. Xaraz thrives in dry, acidic slate-based soil, thus Monte Xaraz was a hill surrounded by Rockroses. Monsaraz is one of the oldest settlements in the South of Portugal, and there are many menhirs and neolithic remains in the area. Due to its strategic location, there was certainly a fort there before Roman occupation. Then came the Moors, and in 1232 it became a stronghold of the Knights Templar. 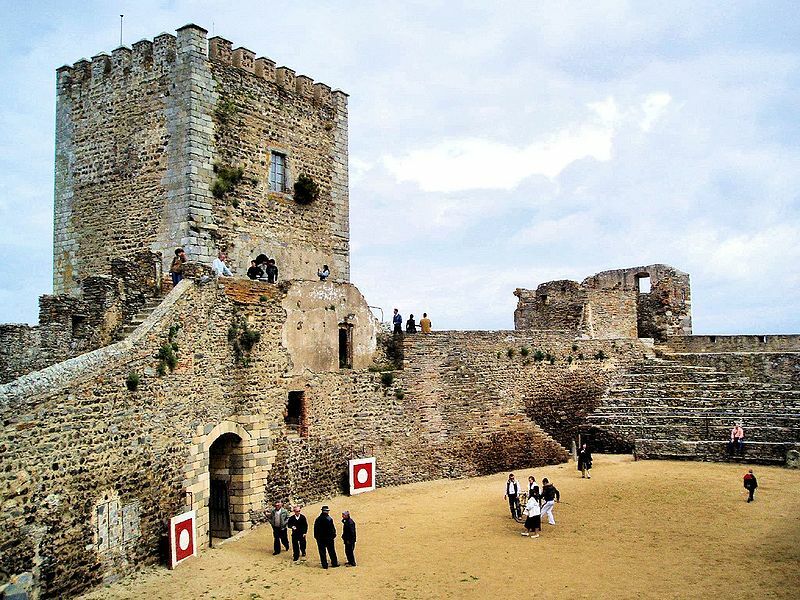 In 1640 it was refortified, during the Portuguese Restoration War and the border struggles. Then land reforms and the growth of farm estates heralded change. These days Monsaraz is no longer embattled, but there are still signs of the past. 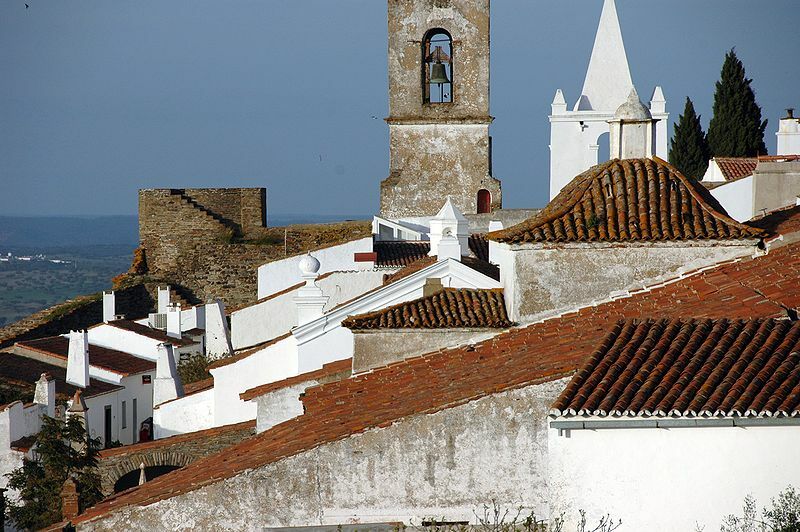 In late October 2009 I journeyed north from the Algarve, across the wide, empty plains of Alentejo. My destination lovely Evora and proud Elvas, but on the return leg I knew I would visit Monsaraz. The weather was autumnal this much further north. Leaving Elvas I headed directly into a rainbow and travelling south the weather steadily deteriorated. I clung tenaciously to the hope that I would be blessed with a patch or two of blue sky, but it was not to be. 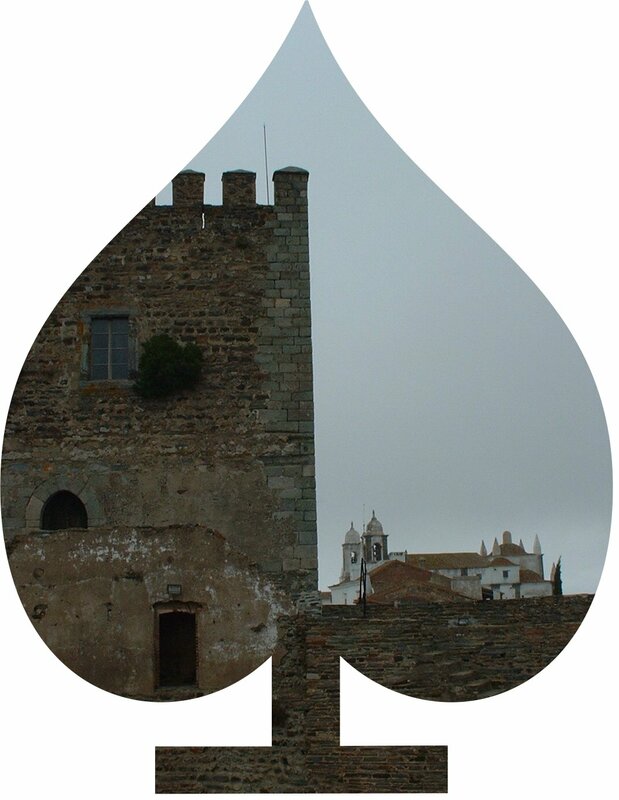 I stepped out of the car under leaden skies and looked up at the castle walls, and then out across the Guadiana. Nothing could prevent an idiot grin settling on my face. I grabbed Mick by the hand and started up the slippery damp cobbles, and through the narrow archway in the walls. 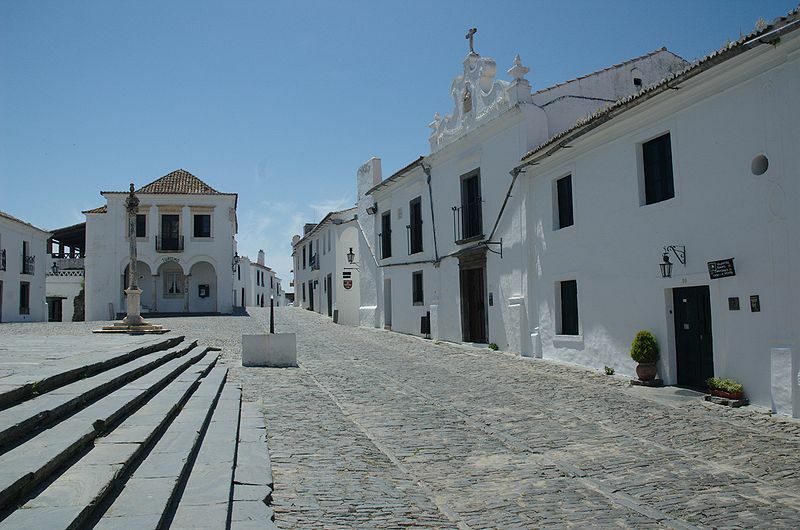 Medieval Monsaraz has only one main street, Rua Direita, with the village square at its centre. The Inquisition House and the pillory point immediately to troubled times. I was more intent on escaping the chill as I slipped inside the Chapel of Sao Bento, with its serene warmth and frescoes. The main church, Nossa Senhora da Lagoa, was closed. 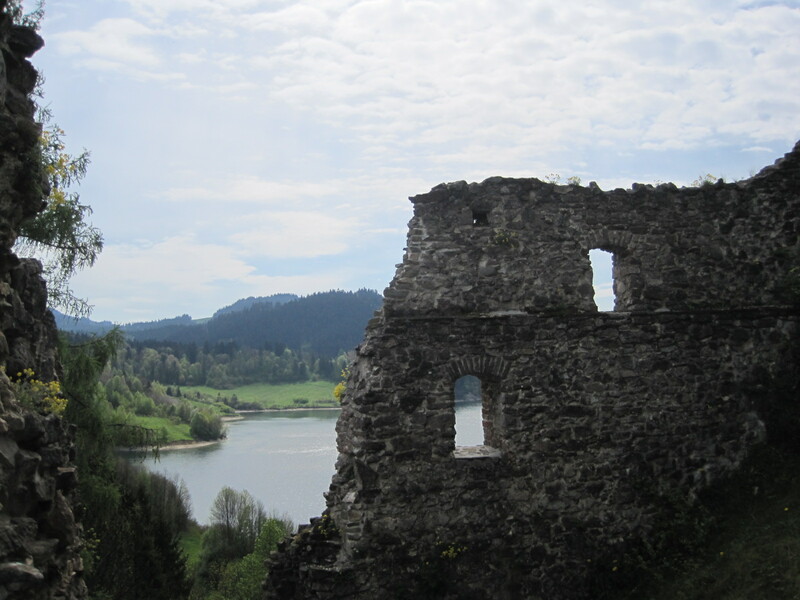 Climbing up to the castle walls, in a light drizzle, I felt I had reached the summit of a watery world. The plains below had been flooded by the creation of the Alqueva Dam, boating heaven in Summer and a vast body of water. The castle is topped by the Witches Tower (Torre das Feiticeiras) and within, the unexpected sight of a bullring, complete with tiered seating! Currently it’s used for Festivals and fireworks, so no sad bulls. As the rain increased its pace, tiny Cafe de Cisterna provided shelter, warm turkey pies and a slab of delicious cake. Despite all that water outside, a drinking supply for the villagers had required a huge cistern to combat the blazing summer sun. It was just visible through a barred window and then the weather really did drive us away. I had planned a leisurely route back, crossing over the dam by a bridge to Mourao, but visibility was so poor that I had no choice other than to agree as Mick pointed the car due south. In a couple of hours I was back under the blue skies of the Algarve. I’ve found a site with some lovely atmospheric photos of Monsaraz, if you click on this link. And you can get a better look at the whole trip on my E is for Elvas, and Evora. It wasn’t all rain! Meantime it’s thanks again to Frizz for prompting me to respond to his Tagged ‘M’ and to Julie Dawn Fox for the Personal A-Z Challenge. And many thanks to you for reading! Loule to me means just one thing. Carnaval! 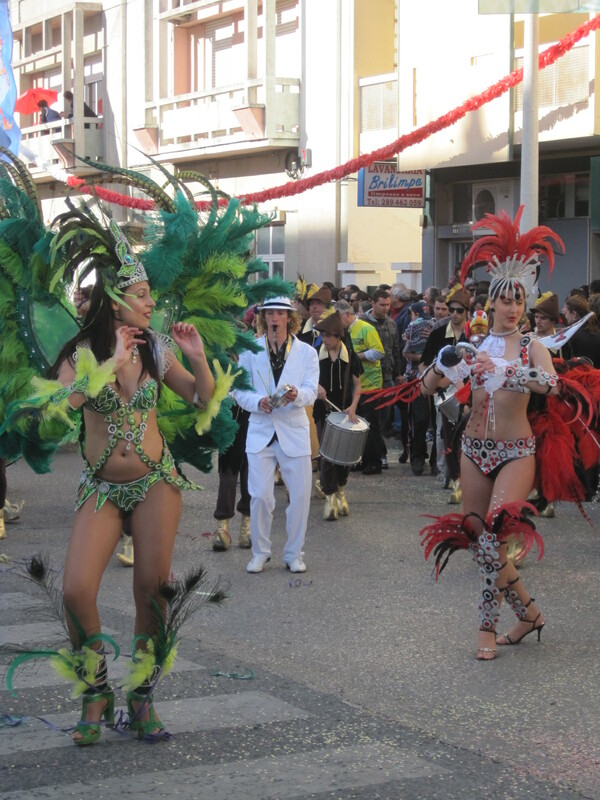 This quiet inland market town in the Algarve is no Rio de Janeiro, but it knows how to party. 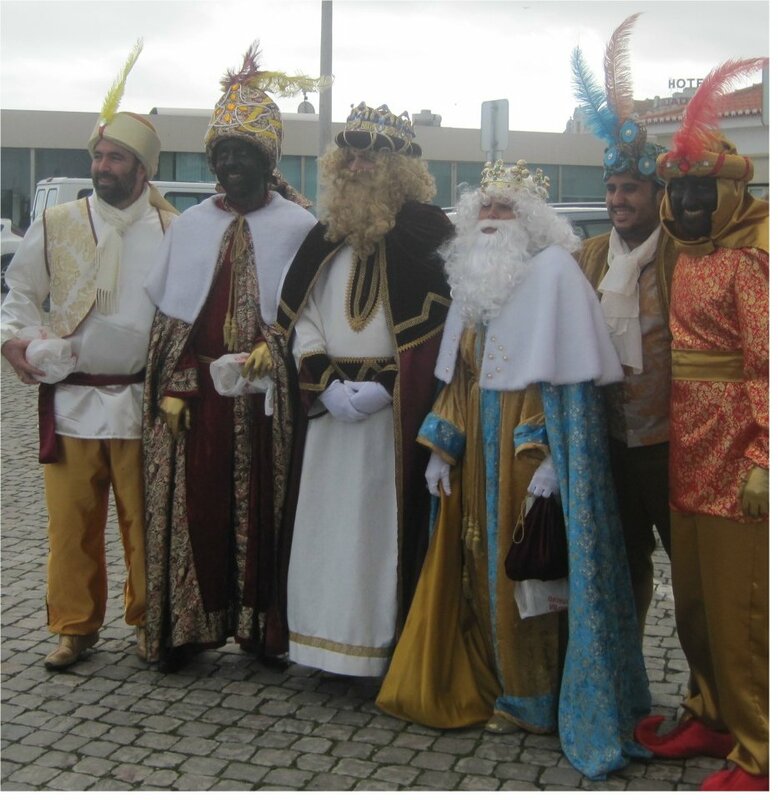 For over 100 years they have celebrated the beginning of Lent with Carnaval, Portuguese style. No shortage of dancing girls either, though they often have to dance hard to keep warm. Bring on the dancing girls! Carnaval 2012 was a classic, and I made a surprising guest appearance! Fortunately I was very easily overlooked in the crowd. Numerous photos of the Carnaval floats, of a distinctly political but humorous nature, appear in my post ‘C is for Carnaval’, so I won’t reproduce them all here. 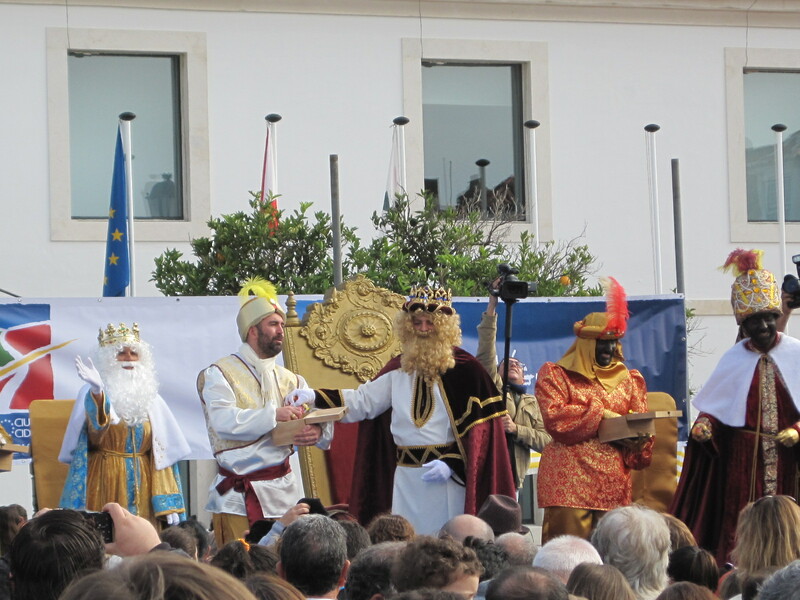 The town’s main street, Avenida Jose de Costa Mealha, is closed for the event and there is a small charge. Don’t miss it if you are in the neighbourhood! Normally Loule (pronounced Loo-lay, incidentally) is rather more sedate. One of the most distinctive features of the town is the Arab style market, pictured in my first photograph. Smaller shops surround the market stalls and it is a treat for both eyes and nose. On Saturday mornings an open air market takes over the outdoor space too. Parking becomes no easy matter. On my first visit to Loule I remember having to search for the remaining fragment of the town walls and the 13th century castle, but I liked what I found. 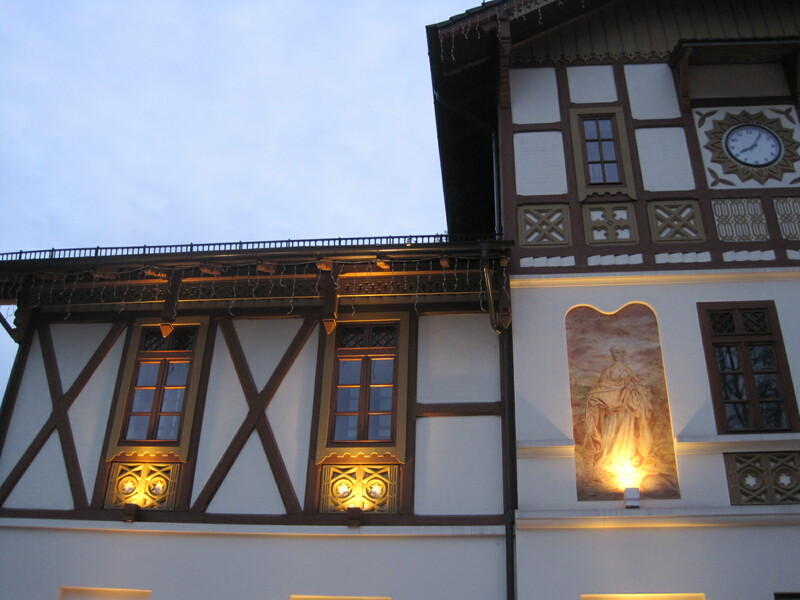 Entrance to the walls is through a small museum, which traces the town’s history back through Roman to medieval times. It has the vaulted brick ceilings that I love. The older part of town is fairly compact , and the narrow cobbled streets reveal artisan workshops and some lovely craft shops. Following the twists and turns you will come to a small square containing the town’s main church, Igreja de S. Clemente, and a tiny garden, Jardim dos Amuados, an ancient Arab cemetery. 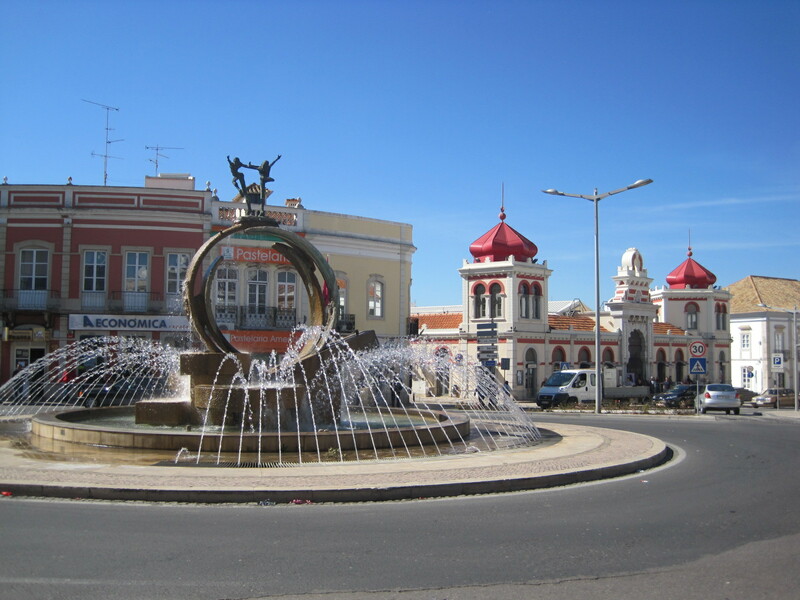 Loule’s main landmark is visible from the A22 motorway when driving past the town. 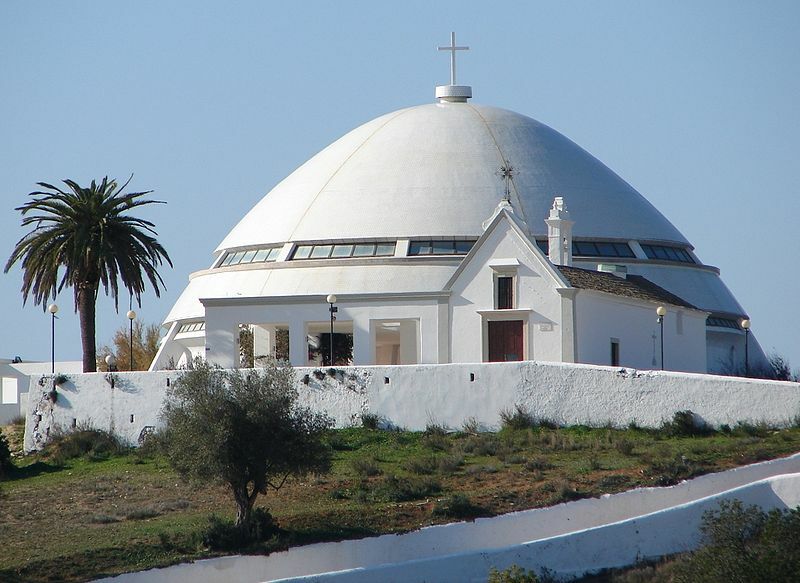 Nossa Senhora da Piedade is a dome shaped modern church which sits on a hill to the west of town. 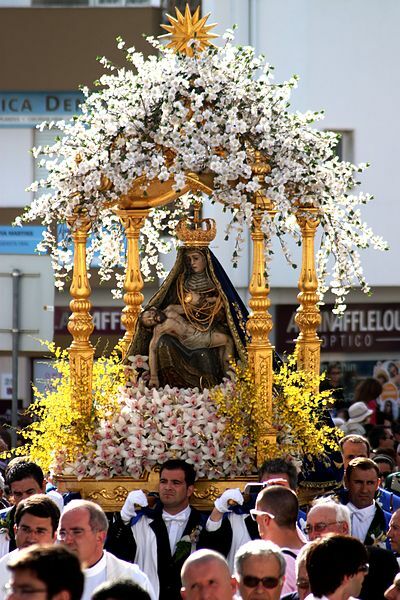 At Easter there is a huge procession in honour of the Sovereign Mother. This must be one of the few things I haven’t yet managed to see in the Algarve. 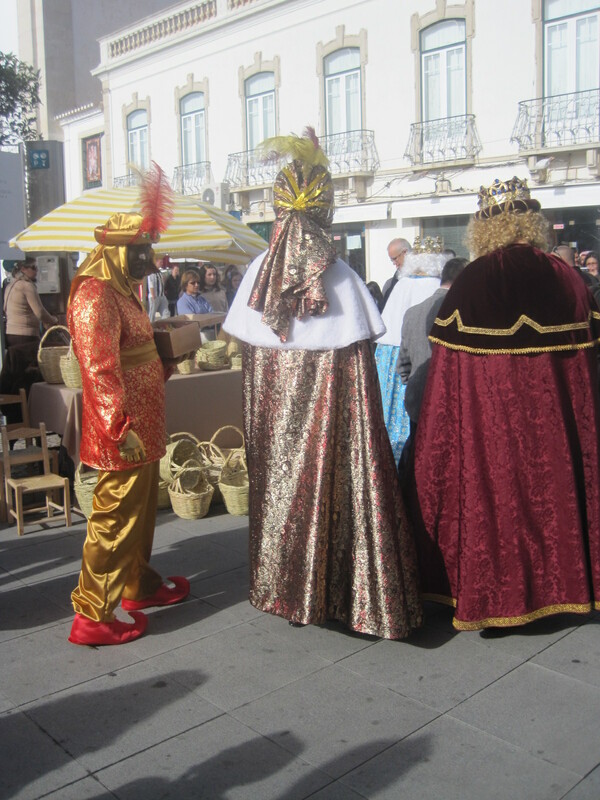 Loule is well worth a look when you’ve tired of the beaches and need a little historical detail, or a shopping bonanza. A few parking hints and a lot of photos are available in C is for Carnaval. For now I’ll simply thank Frizz for his inspiring A-Z series. With Tagged L this week he is just about managing to keep me on track. Grateful thanks are also due to Julie Dawn Fox, who started the Personal A-Z Challenge a long time ago! Some day I’ll manage to complete it for both countries. Join me in the challenges if you can. It’s way too long since I ventured into my A-Z of Poland, so I’m going to introduce to you another of my cousins. A lady who loves to dance and always has a warm smile for me, Irena works hard for a living. She and Arkadiusz (Arek for short) run a market garden in their home town, Bełchatów. Arek grows many of his own plants and seeds to sell in his shop, which specialises in garden products. Whenever she can, Irena helps out in the shop, which she loves to do. Usually this is in addition to factory work, or whatever she can find, to help with the family finances. Irena is the daughter of my aunt Lusia, one of Dad’s sisters, and her husband Zbigniew, whom I never met. When first we got together the photos would come out, many of them tiny squares of black and white, but precious memories, every one. I would try to piece together the story and remember the names of family members who died long before I had the chance to meet them. 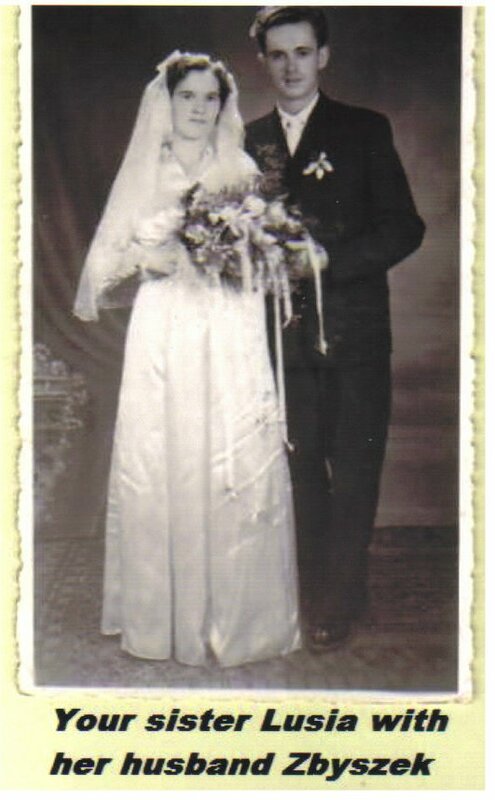 This is one of several photos that were emailed to us when Dad first made contact with his family. It’s a touching story, which many of you know. I should maybe explain what’s going on here. Arek likes a bit of fun. 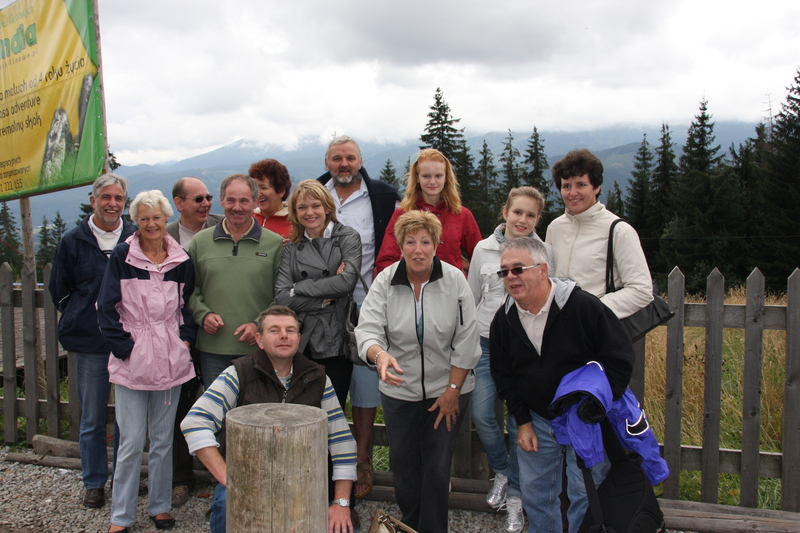 Several years ago the family were in Zakopane for a Silver Wedding celebration. Lynne, my stepsister, and husband George, had joined us from Canada, and Lynne was practising with a new camcorder. Her handbag, containing the camcorder, weighed rather a lot, so Arek was “helping” her to pick it up. 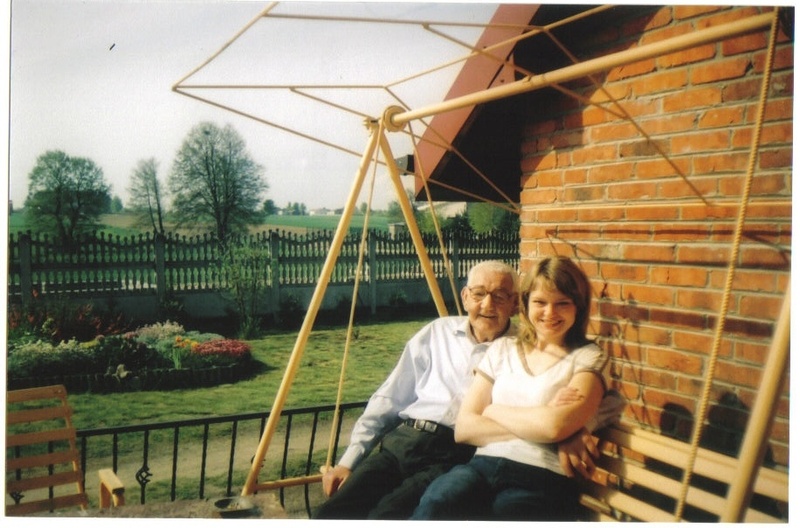 If you aren’t familiar with my Polish story, you could have a look at my Personal A-Z page. Well, I got the hang of that. But did you notice the (on foot)? 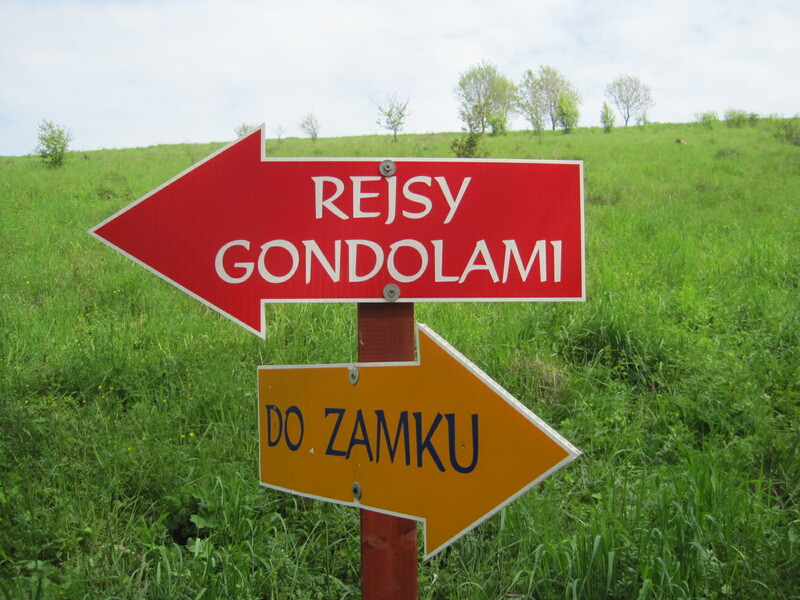 It transpires that there are numerous ways of saying you are going somewhere in Polish, and there is a separate verb for each of them! Thus ‘to go (by transport)’ uses the verb jechać. Sometimes I can remember that verb (and it’s irregular conjugation), sometimes not! Imagine my consternation when I later discovered that if I wanted ‘to go, by plane’ I needed another verb. And so it goes on …. I am a very bad student. I used to love language at school but these days I have neither the patience nor the memory. I recently discovered another ‘i’- Italki. It offers the potential to converse in Polish (and many other languages), at any level, and I have been trying to convince myself to enrol. 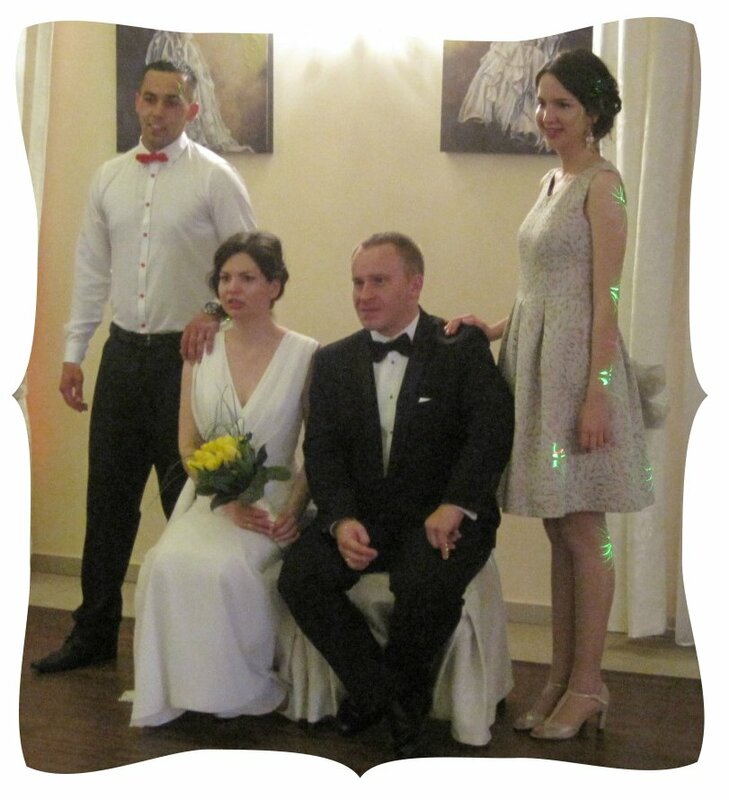 I return to Poland on 29th April, for a family wedding, and this time I will be staying in a hotel with my husband, who will rely on my immaculate translation. You’re right- there will be much nodding of heads and smiling. Many thanks to Julie Dawn Fox for inspiring the personal A-Z Challenge, and to lovely Frizz, who prompts me to return to it whenever I see his A-Z (but never often enough). Do visit these challenges if you can find time. You will be richly rewarded.